Momma's note: With Bear's pancreatitis and everything else stressing me out, my imaginary friend isn't speaking to me at the moment: hence, no humor. Of course, it doesn't help that the Cat Writer's Association Communication Contest results are in with no recognition for our humor; I'm taking that pretty hard. We did however, earn three certificates of excellence for these articles: Feline instincts, Do cats need human interaction or are they completely fine on their own? and The importance of veterinary care for cats and why they're not getting it. To review all the honors and find other amazing writing from my colleagues: CERTIFICATE OF EXCELLENCE WINNERS, Cat Writers Communications Contest covering calendar year 2018. Already demoralized because of the Contest results, I've learned the last two weeks that it's truly a meal by meal battle with Bear's pancreatitis and just because Bear eats healthfully one meal doesn't mean that he's over some magical hump. While I try to remember how to laugh, we're posting our two March Chewy reviews today in pictures. Per Chewy's rules, they will be separate posts. We found out the #ChewyInfluencer program is ending, so these reviews will be the last Chewy reviews we do for awhile. Thank you to Chewy for treating us like family! To read the other review posted today: Momma searches for her sense of humor #ChewyInfluencer. EM: So what's our second Chewy food for March? BC: Phht. She probably got litter or carpet cleaner. BC: How do I manage? EM: YOU eat litter and carpet cleaner? BC: NO! I manage to live with the village idiot. EM: Don't say that about my Daddy! Ooh! I bet this bed in the second item of the month! This is great! BC: That's the packing slip. EM: Whatever you call it. BC: It's a piece of paper! EM: I like to sit on paper. MK: No. Our second item to review is Canidae Adore Shreds with tuna, chicken, and whitefish in broth. BC: THAT'S JUST A RANDOM PIECE OF PAPER! She said TUNA! EM: Don't worry! You're not just a piece of paper! You can be anything you want to be! MK: Are you two ready to try it? MK: Okay. Plate it up. MK: Here you go, Bear. MK: Come on! At least sniff it! BC: If it's so good, YOU eat it! MK: Doesn't it smell good? EM: YUM! This is good! BC: Did we get the same stuff? EM: I'll share with you! EM: MMM ... mmm ... hmm mmm ... hmm mmm ... hmm. MK: Chewy is easy to love: they have a wide selection of QUALITY pet products, freshness is guaranteed, and they offer fast shipping and easy returns on all orders. With orders over $49, one to two day shipping is FREE! After hearing so many bloggers talk about Chewy's fast shipping, I was eager to see the difference for myself ... and sure enough! FAST! Much faster than any other seller I've encountered. Though my favorite part is 24/7 customer service. How many times have I been up late at night shopping for cat supplies, had a question, but couldn't ask it because chat wasn't available? 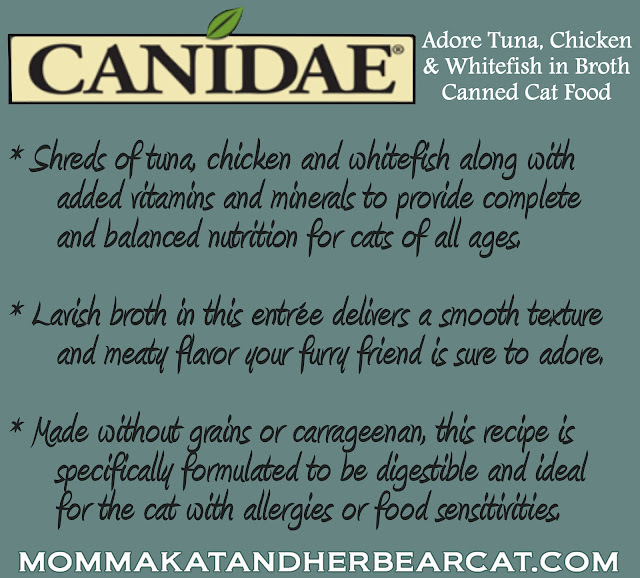 Interested in trying CANIDAE Adore Tuna, Chicken & Whitefish in Broth Canned Cat Food? Go visit Chewy and order a case for your favorite feline! Wonder what we've thought about the other products we've reviewed as part of the Influencer program? To find our past reviews you may follow this tag: #ChewyInfluencer. Chewy is a great company. Too bad they aren't having the Influencer program any more. All cats like different things. Have a great day. It's been an adventure to be sure! Hope you ate both plates of food, Ellie! Great review! Hmmmm, first Chewy killed off BlogPaws, then the Blogger Influencer Program, that's a pretty clear statement me thinks. Seems to me they may be trying to reduce costs. Is there a food that Ellie doesn't like? :-) Even though I rarely reviewed Chewy items, I was still sad to see the program go away. I know a lot of people don't like Chewy, but I personally shop with them (have all my food, litter and flea meds on autoship!) and they treated me well as an influencer. I've been treated pretty well too - though we've only been part of the program for a year. I wish I'd joined earlier! Poor Bear, health issues are stressful. Give him a head bonk from the Tribe. I have to give Jasmine SubQ fluids every other day because of her kidney disease. And as far as humor goes, I think you are hilarious so keep on keeping on! I didn't even get my books entered, life has been filled with trauma for the last 6 months, I'll fill you in at the conference and CONGRATULATIONS on the 3 Certificates of Excellence, you beat us! Thanks! I can't wait to sit down and talk with you! At least one of you loved it. I'm sorry you guys are going through such a rough time :( You should be very proud of your certificates though...you deserve them!!! The Momma Kat would not be happy unless she won every award for blogging every time one is announced. I try to remind myself that the three I earned are good enough ... but humor is the whole point of the blog! I don't know why it matters so much to me! Well I'm with Bear on this as there is no way I would touch it—and thats with just looking at the pictures and Smellie-O-Vision that we have. Sorry Ellie I am sure that that is no relation. One of the reasons I do NOT do food reviews any more is that I have not found a food I like, yup, I am THAT picky. Sorry to hear that things are tough at the moment. You should be proud of yourself though - you are a brilliant writer and we love your humour! Concatulations on the awards you did receive. That's very awesome. I know how good it feels to make people laugh, but you were recognized for making people think. That has lasting value. You may well have convinced to take better care of their cats. Bear... I'm so sorry about that struggle. Getting cats to eat reliably is one of our greatest concerns. Thank you. You are right. I started this blog to share humor and I've often struggled with whether I should star a second one for the more serious articles. MK, I can imagine how you feel regarding Bear's pancreatitis. Somehow I missed that in the other blogs and I don't know how. I was horrified to learn that this morning. I will go back through and see what you said and his prognosis. Love and head bonks to him, EM and Katie sends one straight to you. Congratulations on the Certificates of Excellence. You deserve it, and your sense of humor is right over there..just to your right. I see it. No..look more to the right. See? Thank you. Your comment truly touched my heart. Bear's prognosis should be good - but I'm struggling to find that space where I can feel better about his health. Awwww Bear dude, that pancreatitis is a fluffing fluffer fur sure - when I got my flare ups I ate the Royal Canin gastrointestinal food and that would help no end. AMARULA and The Human: We are so sorry to hear Bear is still struggling with health issues. I personally know there's nothing worse than seeing your beloved kitty struggling to get well! And sorry to hear you are feeling so depressed. I've learned that when it comes to competitions you can just never figure out what when on behind the scenes etc and humor especially is such a personal thing that what makes one person laugh like crazy can be completely over the head of another person. I've also noticed that many people seem to prefer short and snappy humor with just one or two zingers or more subtle humor rather than long, multi-layered humor (like your wonderful posts) so you just never know. You could try shorter and see if that gets you the recognition you deserve as I think you are funny enough to make it work and it might be a good way to flex your writing skills but maybe that means not being true to yourself? Either way we love Bear and his funny bone! I know you are right. I need to rethink my whole format - I've been wracking my brain and not come up with anything. I guess it doesn't hurt to try some! Sending healing thoughts for Bear. My guitar teacher reminded me of my strengths when I played through a song and got one note wrong. I said that it sounded pretty good except for that one off note. He said, "well, what about the 100 plus notes that you played perfectly?". You're like me, try to focus on the 100 plus good things and not the one bad. Besides, I have to remember to not drink anything while reading your blog, it's a pain in the neck having to clean nose tea off my Kindle. That's right, your posts make me shoot tea out of my nose from sudden bursts of laughter. Congratulations on the certificates! Thank you. I needed to hear everything you said - from the take on perfectionism to how much we make you laugh. That kind of humor is what I want to provide! We're sorry you're struggling right now, Momma Kat. Please know that we care, and that we love and appreciate you. Pancreatitis is so difficult to manage; we hope you and the docs can figure out how to balance all of that soon. Congratulations on your Certificates of Excellence. So well-deserved. Big hugs to you, Bear Cat, Ellie and The Boy. With an elderly cat who makes meal time challenging every single day, we feel your Momma's pain. Plus, no one gets our sense of humor either. Blogging these days is changing, and that also makes us sad. Congratulations on the much-deserved recognition you got! I hope Bear is feeling better. I am going to miss the Chewy influencer program. Me too! It was a great way to try new brands. Bear's still not 100% but we're working on it. CONCATS for the CWA awards! Your articles were TOTALLY deserving of them! Don't be discouraged about not getting certificates for your humor. I'm guessing CWA isn't big into humor. Think of all your fans like me and Mom that luv what you do and how you say it. Purr purr purr. Thank you, V. You're an amazing friend!